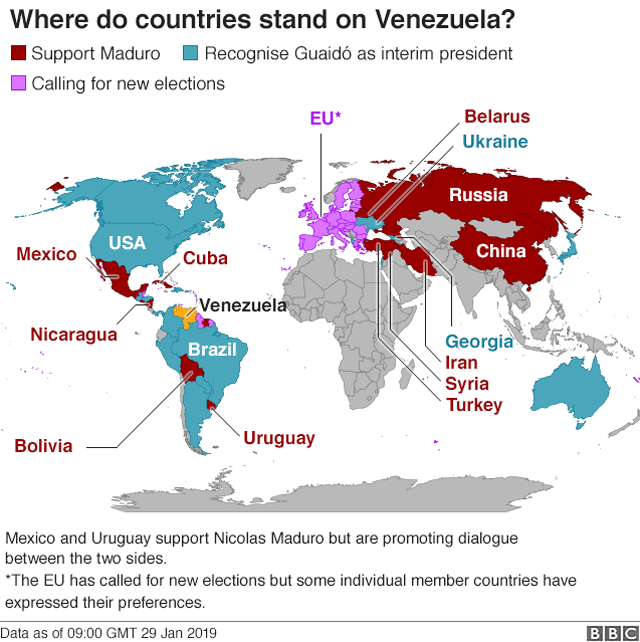 « Why the push for ‘regime change’ in Venezuela? I must confess my knowledge of Venezuelan politics is limited to having read some magazine articles. I don’t speak Spanish, I don’t know anybody in Venezuela and I can’t judge the balance of responsibility for Venezuela’s plight between Hugo Chavez and Nicolas Maduro on the one hand and U.S. intelligence agencies and the Venezuelan upper crust on the other. One thing that is plain is that neither Chavez nor Maduro were dictators of the same type as Fidel Castro or Augusto Pinochet. If they had been like Castro, the opposition wouldn’t have been allowed to arise, and Maduro’s power would not be threatened as it is today. I once put up a post saying Castro’s economic policy was a failure, but Castro in fact was a success in preserving the independence of his country against the USA, the world’s largest military and economic power. Another thing that is plain is that the U.S. government made things worse by its meddling in Venezuela—encouraging military coups, encouraging civil unrest, attacking Venezuela’s economy and now trying to name its head of state. A wise American leader would have gained respect by refraining from threats, plots and attacks and trying to broker a peace among Venezuela’s factions. Marco Rubio’s strategy for winning influence over Trump on Venezuela by Joshua Keating for Slate. This entry was posted on January 30, 2019 at 7:25 pm and is filed under Foreign Affairs, War and Peace. You can follow any responses to this entry through the RSS 2.0 feed. You can leave a response, or trackback from your own site.